It is truly frightening how many shower niche install mistakes that can happen in a typical shower remodel, especially if your contractor is building you a custom shower niche. But even if you are planning to go the much safer route and install a pre-manufactured tiling niche or finished niche, you still must adhere to a few rules and procedures. Following this advice could save you the nightmare and expense of moisture and mold growth in your walls, and tearing out your dream shower to do the job correctly a second time. That should be motivation enough for you to read this article. 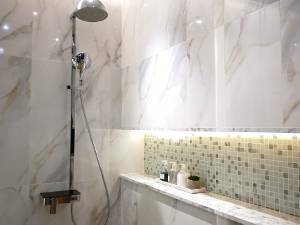 This is Steve from SKG Renovations (Steve’s Bio) with a few tips you must know to avoid the 4 BIG shower niche install mistakes during your next shower remodel. If you plan to install a custom built shower niche into your shower wall, and you want to avoid making one of the biggest shower niche install mistakes, you must make sure that you or your contractor doesn’t forget the waterproofing step. When a custom niche is built well, it can look very sturdy, solid and deceptively waterproof. This is a assumption made far too often when shower niches are framed into the shower wall. No matter how tight the joints may look in a newly constructed niche, they will not keep water from penetrating and running into the stud cavity if it is not properly waterproofed. You may be thinking that a leak like this seems unlikely if the niche is properly tiled & grouted after construction, and you would be right……… for awhile. The constant water exposure and regular temperature changes makes the shower environment quite unforgiving. These environmental stresses cause all parts of the shower assembly to move slightly, mostly through expansion and contraction. 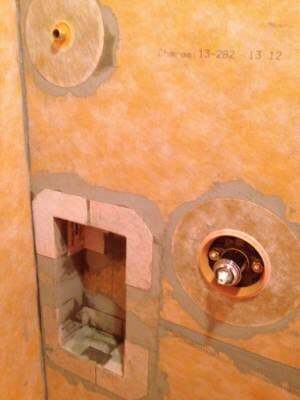 Without a waterproofing membrane, this movement almost always causes grout line cracking in your shower niche. It usually starts out as very fine cracks at the corners that can’t easily be seen. But even the smallest cracks will allow moisture to penetrate, moving easily through the backer board seams, to the framing beneath. The rest you can imagine; moisture in the walls, which leads to mold, dry rot, etc.………. something you can easily avoid. Whether you or your contractor uses a liquid or sheet style waterproofing membrane, it does not matter, as long as you don’t skip this important step during your next shower remodel! If you decide to install a pre-manufactured, or finished shower niche instead of a custom built one, you can avoid another shower niche install mistake by making sure that you never install a retrofit shower niche. A retrofit niche is a product that is installed in the process of a new shower remodel project after the shower wall tile has already been installed. What that means is that a hole is cut for the niche into the tile backer board after it is attached to the shower wall framing. The tile is then applied on the shower wall as usual, but the hole is left exposed so the retrofit shower niche can be inserted into it. The niche is placed into this hole, and the outer flange on the niche is pressed against the tile. A bead of silicon around it’s perimeter completes the installation. It doesn’t take a waterproofing expert to see that this tiny silicon bead is the only defense against water running into the wall cavity. Does that sound sensible to you? If you said no, you would be correct. It may seem like a slightly easier way of installing a shower niche, but it’s not really any easier to install than some other finished shower niche products, and it violates the industries recommended “best practices”. It’s really not worth the risk. To avoid the BIG shower niche install mistake of not waterproofing, you definitely want to avoid the finished shower niche insert products that do not integrate with the shower wall waterproofing membrane. Although the waterproofing procedure of the custom shower niche is much more involved that of a finished shower niche, it is equally important. Only a few finished shower niche products come with a perimeter flange designed to be mounted flush with the tile backer board surface. This flange is critically important because it is the surface upon which the shower wall waterproofing membrane will attach. It is only via this attachment that the integrity of the waterproofing membrane can be maintained, keeping your shower wall safe from the risk of water infiltration into the wall cavity. In the section above, we discussed the retrofit style of finished shower niches that DO NOT integrate with the shower wall waterproofing membrane. 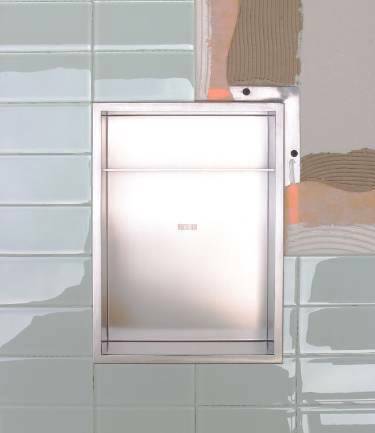 Alternatively, in the adjacent image you can see an example of a finished shower niche installed with the tile and membrane cut away to show the mounting flange, which also serves as a membrane bonding surface (niche by Redblock Industries) . Not only does this flange allow a positive attachment to the waterproofing membrane, it also allows for an additional seal under the flange, and a firm attachment to the shower wall framing via the mounting screws. This double protection can provide anyone with the piece of mind that their shower niche, and the entire surrounding assembly, will never leak. Another BIG one among shower niche install mistakes, is the construction of a custom horizontal tiled niche that compromises the structural integrity of the shower wall. If you are considering installing a niche in your new shower remodel project, you have likely seen many examples of this type of niche. 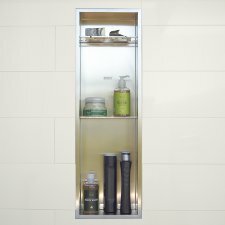 These horizontal niches are the epitome of opulence, sometimes spanning the entire shower wall and offering a huge area for storage. 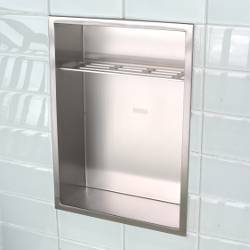 There is a way to install these shower niches correctly and safely, but unfortunately many contractors fail to accomplish this. Most horizontal niches are installed in the back shower wall; usually the longest, and therefore, the most flexible wall in your shower surround. Sometimes this is a bearing wall that the structural integrity of your home depends on, and sometimes it’s not. Either way, cutting a horizontal swath out the structural members of this wall to make room for a niche is a problem. Some contractors believe that applying the correct structural framing around the niche will adequately fortify the structure. The problem is that these measures mostly address structural stresses applied from above, but do not adequately address the increased flexibility (reduction in rigidity) caused by cutting out the vertical framing. The integrity of a tiled assembly requires significant rigidity in this wall to reduce the chance of grout cracking, tile delamination and failure of the waterproofing membrane. Some contractors do not even install the minimal surrounding structure required, which profoundly compromises the wall’s structural rigidity. If the niche you are envisioning for your next shower remodel will horizontally span more than a couple of wall studs, the only way to properly and safely install it is to build a new wall to contain the niche, in front of the wall where the niche was to be installed. This allows you to support the precarious top and bottom portions of this wall against the back & adjacent walls. Talk to your contractor about it, because it’s extremely important that you avoid this huge shower niche install mistake. This would not necessarily be considered among the 4 BIG shower niche install mistakes because there is a correct way to mount a shower niche into an outside wall without too much of a downside (if the conditions are right). If the conditions are NOT right, then it could turn into a real problem, so I though it would be worth addressing in this post. As a general rule it is always the best idea to mount your tiled or finished shower niche in a wall that is not an outside facing wall. The problem is that the shower environment is a very moist one, and some of this moisture will always make it into the stud cavity through the wall tile, your tile backer board and often through your shower niche. How much water vapour will exist here is entirely dependent on whether or not a waterproofing membrane has been installed on the shower wall and how well your shower niche resists moisture penetration. The moisture permeability of your niche will vary greatly, depending on the type of niche you decide to install, and the installation technique, of course. With this reality in mind, one can start to imagine why it is risky to install your shower niche in an outside wall. In most older homes, the stud cavity is only 3 1/2″ thick and the comfort of your home often depends on this space being filled with insulation. Even in a relatively mild climate, the colder months can result in a vast difference in temperature from inside to outside. Only a small temperature differential from can cause the moisture in this shower wall to condense on the inside of the wall. Even without a shower niche, this can easily occur within a 3 1/2″ stud wall in the colder months, especially if there is no waterproofing membrane on the shower wall. With a shower niche taking up most of the space in a 3 1/2″ stud cavity, moisture condensation in the wall is virtually guaranteed if the temperature drops a few degrees outside compared to inside. Of course, none of this will necessarily occur if the shower wall and niche are properly waterproofed, and there is enough space behind the shower niche for adequate insulation. Needless to say, there is a complex series of factors to consider like stud wall thickness, local climate, waterproof integrity of your shower, and the quality and thickness of the wall insulation. In other words, you should definitely ask a trusted local contractor before you decide to install a shower niche in an outside wall to avoid this potential shower niche problem. Installing a shower niche can be a deceptively complicated and risky endeavour, but it is possible to avoid the 4 big shower niche install mistakes. By reading this article, hopefully you have gained some insights into the risks of installing a shower niche improperly, and the rewards of doing the job right. Good luck with your new shower remodel project, AND enjoy your new shower niche!